The caption simply says ‘Martha’. I have no idea who Martha is. This photo dates from the early 1920s along with many of the Lowry and Pepperney photos in that collection. I checked my family tree and there are no Marthas of a matching age or relation to fit here. I checked the Lowry and Pepperney neighbors from the 1920 Federal Census and again, no dice. 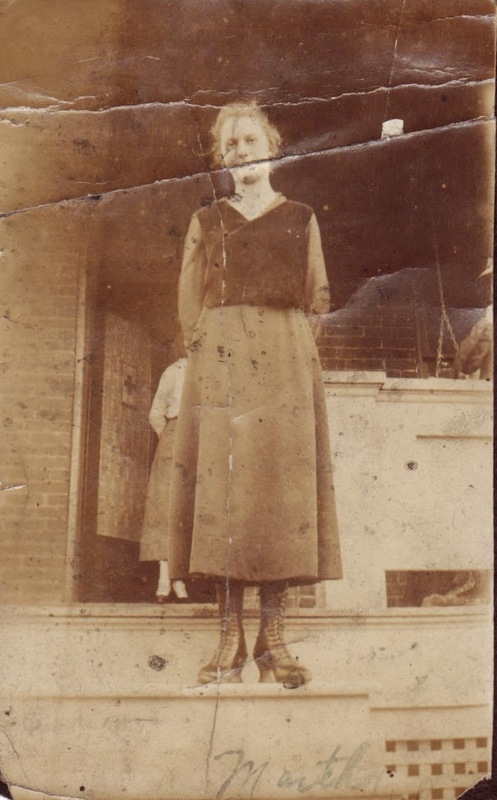 Maybe further research will reveal this Martha, but in the meantime, enjoy a photo of her standing on someone’s front porch in a long skirt and heeled boots. Martha (unknown), photograph, taken at unknown location around 1920; digital image, photocopy of original, scanned in 2013 by Joseph Lowry; privately held by Mary McCaffrey, [address for private use], Canton, Ohio. Woman in long skirt and heeled boots. Provenance is Mary Pepperney Lowry to Charles Lowry to Mary McCaffrey.